LUDLOW – Consistently cold overnight temperatures paired with the unwavering dedication of Okemo Mountain Resort’s experienced snowmaking team resulted in the opening of the only superpipe in the East this week. Featuring 18-foot walls and extending over 500 feet in length, Okemo’s Amp Energy Superpipe is now open daily. Okemo’s 18-foot superpipe is located in The Zone and accessible via The Pull surface lift. In addition to the Superpipe, the resort has also built seven terrain parks containing 66 jumps, rails and other creative features. Construction of the Okemo Amp Energy Superpipe required 51 acre-feet of snow, approximately 12 hours of excavator time, and 145 hours of operators working in snowcats to complete the project. 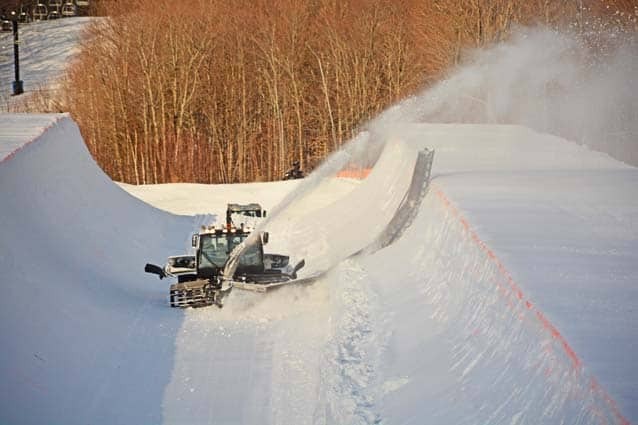 The resort is scheduled to host the 2016 USASA Revolution Tour East Coast Halfpipe Qualifier on February 21. For more information about Okemo Mountain Resort, visit www.okemo.com.